It’s all change for Market Rasen rider Jason O’Halloran after signing a deal with McAMS Yamaha for the 2019 British Superbikes campaign. O’Halloran has taken the seat vacated by fellow Australian rider Josh Brookes who has moved to Paul Bird’s Ducati team. 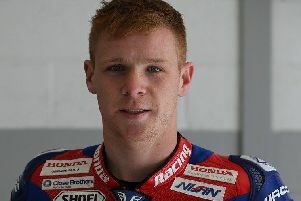 The likeable Australian rider has spent the last few years racing for the Louth-based Honda team, but despite a good start to the season, he was plagued with a severe ankle injury which he picked up in a crash in a one-off World Superbike race. O’Halloran announced his new ride at the Motorcycle Live show, and will run alongside last season’s rookie sensation Tarran Mackenzie. The Lincolnshire-based rider will bring a wealth of experience to the team from both racing and development, and after a tough 2018 season, will be pushing for a return to the end-of-season Showdown which he narrowly missed out on this year. “It’s a new chapter and it’s really exciting to be joining a new team and manufacturer after a long time in the same place,” he said. “I have big aims and know I’ve got loads more to prove; people haven’t seen the best of me yet! “The bike is a proven race winner and the team has great pedigree, so I believe we have the ingredients to fight for wins. “I’ve followed the R1 plenty and it seems like you need to be smooth and hold good corner speed, things I really think I can work with. The Lancashire-based Yamaha team had a successful 2018 season, taking three wins and a further seven podiums in only their second year in the series. Now they will be looking for more in 2019 as they prepare for their first pre-season test at Almeria, Spain, to put their freshly-prepped YZF-R1 machines through their paces.